Customized Fireman Key Chain for Dad ! 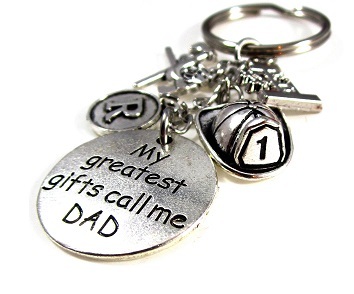 Personalize a special Key Chain for Fathers Day, Dads Birthday or ANY DAY. This special Key Chain will come standard with the '#1 Dad' Charm, 'Firefighter Helmet' Charm, 'Firefighter Axes' Charm, round 'My Greatest Gifts Call Me Dad' Charms.. with your choice of Initial charm for Dad ! This handmade key chain is approximately 3.5" from end to end - perfect for Dads Keys!